Dwarfed by the five-feet jumble of trash along Route 13, the lifeline of Laos, he nervously poked his stubby walking stick to dislodge the mound. On further coaxing, the precarious heap collapsed, scattered unceremoniously. Unable to conceal his excitement, a shrill wave of laughter escaped from his mouth. A flimsy polythene bag hung from one side of his trousers, and each time he took a few steps to survey the trash site, the transparent polythene, now full of aluminum cans and plastic cola bottles, clanged against his pants, in sync with his movement. Now, a treasure trove of trash lay ahead of him. In one hand, he held a soiled styrofoam plate and an aluminum cola can on the other. He flung the styrofoam back and walked away with a bunch of cans salvaged from the heap. 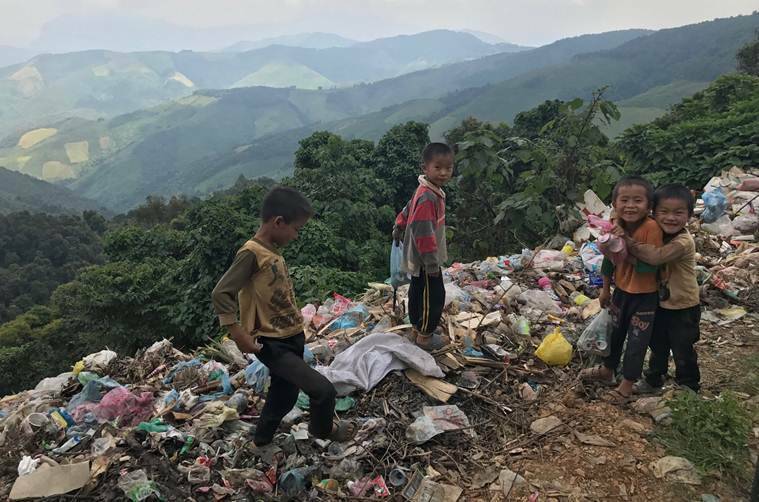 The five-year-old Laotian kid and his friends sort through large amounts of unsegregated trash nearly every day in search of higher quality plastics and metals for recycling. Not all plastics are created equal, and styrofoam sits at the bottom of the value chain. It cannot be recycled, so there’s no incentive to pick it up. From where I am, the bird’s eye view of the Laotian city of Luang Prabang, with the muddy brown Mekong river snaking around in a tight embrace, is interrupted by this picture of kids scavenging through unsightly heaps of plastic trash scattered along the hillside. This paints a classic contrast of sorts as Luang Prabang is a UNESCO World Heritage Site, lauded in part for its cleanliness, and just a few kilometers away from the city, you see litter dotting the rural and urban landscape. This is the staple view of every town, village, valley, and road in Laos. I was on a three-month solo motorcycle ride on a Royal Enfield Standard 500 across five countries – Myanmar – Laos – Thailand – Cambodia and Nepal – to challenge the everyday use of single-use plastic through a recreational activity called Plogging – a mix of jogging and picking up trash. An import from Sweden, Plogging is a combination of two Swedish words – ‘plocka upp’, which means to pick up. 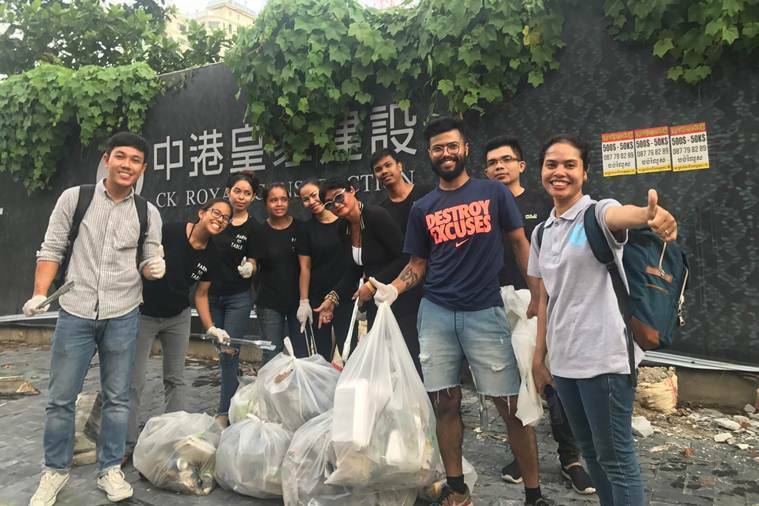 It snowballed into a global fitness and environmental movement in 2018, with many individuals establishing their own local chapters across Europe and Asia. 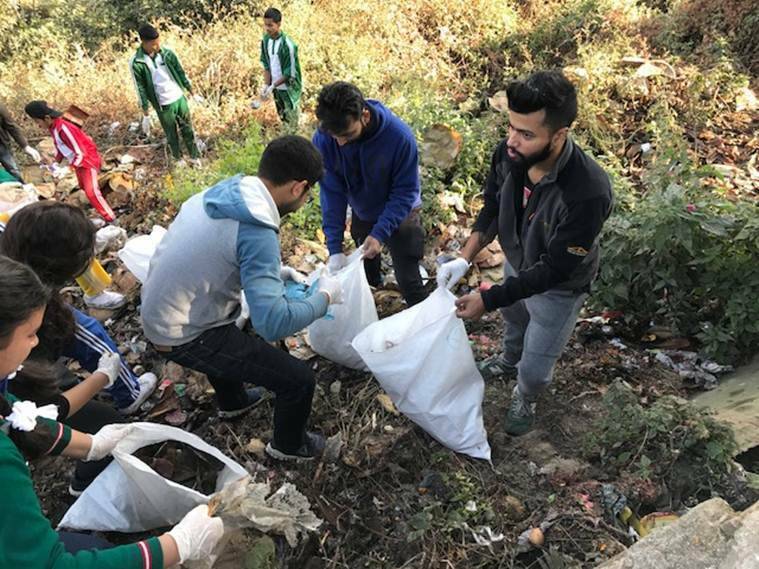 In January last year, I started my own plogging community called Plogga India in New Delhi as a way to galvanise individuals and communities to take care of their surroundings and pay attention to waste segregation at source, oft-repeated in government sanitation programmes but rarely implemented. Six months into my campaigns, I read a 2015 report published by the environmental campaigner Ocean Conservancy and the McKinsey Center for Business and Environment that said five Asian countries – China, Indonesia, the Philippines, Vietnam and Thailand – accounted for up to 60 per cent plastic waste leaking into the ocean. I saw an opportunity in this to connect India’s waste challenges with our neighbours and exchange ideas. There is an Asian highway that runs through India and all the way to Cambodia. This is when I decided to take the trip on my motorcycle. 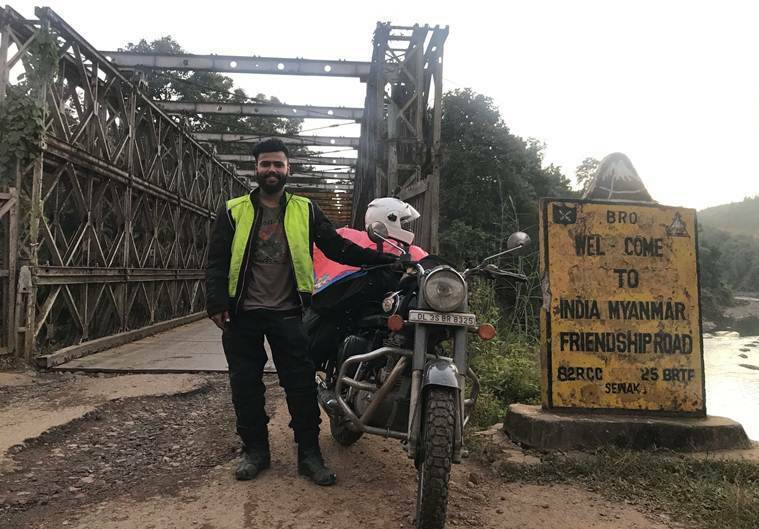 So I set off from New Delhi on September 15, 2018, and travelled across Uttar Pradesh, Bihar, West Bengal, Assam, Nagaland, Manipur, before crossing over into Myanmar to begin the first leg of my international journey. 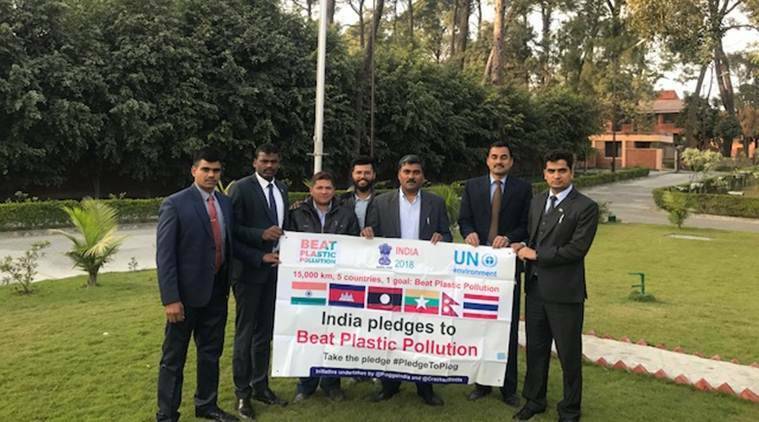 I stopped at each of these Indian states and countries, collaborated with schools, NGOs and communities to clean up a designated area of litter as a way to take affirmative action against single-use plastic through plogging. When I plog, there’s a method to the madness: I segregate recyclable and non-recyclable waste into separate bags and conduct a small waste audit. This helps narrowing down on the single biggest plastic polluter in that area. I found this to be an effective tool to engage communities and drive home the idea of social sustainability. The takeaway is this: one pro-environment behaviour can trigger one’s commitment to other environmental activities or at least pushes you to think in that direction. I also documented the viewpoint of the local population on plastic and whether they are aware of its damaging effects in an effort to piece together a narrative on plastic pollution. Another aspect of the project was to show a 15-minute audio visual to my audience on the global plastic pollution scenario and some waste management solutions from Indian cities such as Panaji, Alappuzha, Mysuru, Gangtok, and Indore. Awareness of negative effects of improper waste collection and disposal, including environmental issues caused by the leaching of hazardous substances into soils and water, and human health problems due to inhalation of the smoke of burning plastics, remains low in India and much of Southeast Asia. Which is why a project of this magnitude was important, to not only understand what these countries are doing individually to address plastic pollution, but also to promote plogging as an activity that can empower individuals, communities and civil society to acquaint them of the hazards of single-use plastic — the biggest elephant in the room. Right from the outset, this project wasn’t a campaign against plastic. But a journey to understand this ubiquitous material that we’re so used to seeing, using and disposing of in our everyday lives. We’ve accepted the status quo, and stopped asking important questions: Is plastic necessary? Where does it come from? How is it made? Where will it end up once it has served its purpose? Let’s also wrap our heads around the grim reality that plastic production growth has far outstripped the ability of waste management to control. This surge in production has largely been due to an ever-increasing consumption of disposable plastic packaging, the ones we consume for a few minutes and throw away. Most of these types of single-use plastic are never disposed of properly so they are never collected, recycled or incinerated. One of the solutions is to use less of the stuff in the first place. Our addiction to single-use plastic is embedded in our consumerist lifestyle. To upend this will require resolve and making difficult decisions, no matter how unpopular it may seem. Can we imagine a world where everything that is designed is meant to either last or becomes something else (circular economy) once its life cycle is over? It’s time to rethink and reevaluate our relationship with plastic. India is a victim of a flawed system of waste collection, transport, treatment, and disposal. Rapid urbanisation and increasing population are the prime reasons for the increasing solid waste in cities as we shift more towards a net consumerist lifestyle. The fallout of these improper waste practices on the environment and public health is immense. In New Delhi, for instance, despite Solid Waste Management Rules (SWM 2016) in place, precious little has happened on the ground, even as almost all municipal authorities dump the waste outside the city haphazardly. “As a rule book, it’s very good. But on the ground, in metropolitan cities, nothing is happening. After rules, states had to give action plan and update bye-laws and that’s not happened in at least 70-80 per cent cases. There’s been a major non-compliance of Delhi’s bye-laws itself,” says Swati Singh Sambyal, Programme Manager at the Centre for Science and Environment in New Delhi. A large part of the waste management challenge is non-segregation of waste at source, shortage of garbage vans for collection, tracking and monitoring of waste transportation. “The SWM Rules of 2016 are pretty intensive but the problem is with the implementation and enforcement of those rules across all the stakeholders. There is not enough drive nor will to change the status quo and implement the new rules. The practice of segregating waste is not done by a major chunk of our society,” explained Wilma Rodriguez, CEO of Bengaluru-based social enterprise Saahas Zero Waste. Because there is no segregation at source, mixed waste ends up in landfills. The reason why frequent fire outbreaks, methane discharge, and landfill slides are a common feature at dumpsites. Unmanaged waste – among other factors like crop burning, vehicular emissions, construction, thermal power plants – also contributes significantly to air pollution. “If you compare the pollution levels in Ghazipur, Bhalswa and Okhla in Delhi with other areas, one can see the level of air and water pollution caused due to the water in the landfills and the burning of waste. People living close to some of these landfills are routinely exposed to extremely polluted air and drinking groundwater that’s not fit for consumption,” said Tamseel Hussain, founder of Pluc TV, an organisation that documents pollution stories across India. “Waste management is very much social engineering, you can have technology in place but if you can’t make people understand segregation, there is no point,” added Sambyal. One of the topmost priorities, experts believe, is to shift our reliance away from sanitary landfills that give no environmental protection to waste management systems that retain crucial resources within the economy. “As a nation, we are very dependant on land for disposal, do we really need land for waste management? Of course, Swachh Bharat mission has brought a paradigm shift in the thought process, but change on the ground has been nothing. Delhi is in a miserable state,” said Sambyal. “There has been more urbanisation in 50 years than what we have seen in the last 1,000 years. So if we are generating 71 million tonnes of waste everyday, then it will only increase, unless we reduce our waste and ensure segregation at the household level. Reduction and segregation are the keys to success,” said Kant, adding that the country needs to move away from a liner to a circular economy. The country’s planning body chief also said that if we are to adopt Sustainable Development Goals’ (SDG) best practices, then we need to discourage setting up of landfills. As our per household waste generation increases, so will the load on our landfills. Delhi’s Bhalswa landfill, for instance, was exhausted in 2007 but dumping continues even now. According to data shared by Delhi Fire Services, out of 131 major landfill fires in Delhi, 69 took place at Bhalswa alone. Landfill fires are one of the major reasons for deteriorating air quality in Delhi. “Our Air Quality Life Index (AQLI) suggests that, on average, air pollution is substantially reducing life expectancy in Delhi. It’s possible that air quality is much worse near landfills, and the resulting health impacts are much greater as well,” said Dr Ken Lee, Executive Director, Energy Policy Institute at University of Chicago in India (EPIC). To incinerate waste or not? As an alternative to take load off sanitary landfills, and to convert that waste into energy, incineration plants come into the picture. This, the government believes, could be a silver bullet to solve the waste crisis in urban cities. Sharing statistics on waste-to-energy plants, Minister of Urban Affairs and Housing Hardeep Puri had said last year that in India almost 88.4 megawatts (MW) of energy is generated from Waste to Energy or WTE projects. The push to adopt WTE plants also came from the government’s planning body NITI Aayog last year in August, when they suggested setting up of ‘A Waste-to-Energy Corporation of India’ under the Ministry of Urban Development. In its three-year action agenda 2017-18 to 2019-20, NITI Aayog proposed that municipal solid waste be burnt to produce energy. “To speed up the process of cleaning up municipal solid waste, it may be worth exploring the possibility of an authority at the Centre to spread the use of ‘waste to energy’ plants,” the statement said. The planning body underlined that cities have been “slow to develop effective ways” to dispose municipal waste and called for accelerated action to combat the problem. WTE plants may seem like a viable solution to tackle the increasing garbage pile-up in cities, given that the energy derived from it is a crucial element of SWM and it reduces the volume of waste. But in the waste management hierarchy, it ideally falls after segregation, collection, recycling, transportation, and before it goes to the landfills. However, if the past is any indicator, at least half of India’s WTE plants meant to convert non-biodegradable waste into energy are defunct, observed an analysis by the Centre for Science and Environment (CSE). Ever since 1987, out of the 15 WTE plants established in the country, plants in Delhi, Bengaluru, Kanpur, Lucknow, Hyderabad, Vijayawada and Karimnagar have shut operations. Some key reasons behind their closure are the WTE plants’ inability to handle mixed solid waste coupled with the high cost of electricity generated by them making it non-appealing to power companies. “The world and India should be moving towards maximum resource recovery. And in this context, WTE does not fit in. This model has been tried out already and the shutting of almost half of the WTE centres are proof that it is not a sustainable model,” said Rodriguez. The informal sector is the backbone of our country’s waste management system and recycling economy. People working in this sector collect household waste from door-to-door for a collection fee and obtain additional income by selling recyclable materials. They ensure less waste reaches landfills. But ironically, these waste pickers, who come from marginalised communities, are not only ignored, but face discrimination and kept out of government schemes. The sorry plight of these informal waste pickers mostly goes unnoticed. A report by non-profit Chintan, that actively works with waste pickers, observed that civic bodies across the country fail to recognise the contribution of the informal sector in recycling waste. The study titled ‘Failing The Grade’ says that despite the CAG report of 2007, which evaluated the performance audit of waste management in India, guidelines for incorporating the informal sector have been ignored. In the report, the non-profit noted that five years after the CAG report was released, there are new policies put in place that include the informal sector but their implementation still remains unmonitored. Even official government figures highlight the crucial role played by the informal sector. Informal waste pickers “reclaim, reprocess and recycle 81 percent of the solid waste generated in cities – that would otherwise be disposed of in open unsanitary dumps or burned in incinerators” read a statement by Hardeep Puri when he had released The National Urban Livelihoods Mission (NULM) last year in May. While their role in the waste management economy can’t be emphasised enough, their inclusion into the formal workforce remains a pipedream. While our challenges are significant, so are the opportunities: Mysuru, Panaji, Alappuzha, Gangtok, and Indore have already set an example of sound waste management practices that go far beyond cosmetic changes. Indore, for instance, was adjudged India’s cleanest city for the third straight year in the central government’s Swachh Survekshan Survey 2019. What makes Indore so special? Its highly robust waste segregation, collection and transportation system. CSE’s ‘Forum of Cities that Segregate’ assessment report 2017-18 found Indore to have achieved higher than 90 per cent waste segregation and wet waste processing. Down south, Kerala’s Allapuzha adopted a decentralised waste management system and has consistently pushed for 100 per cent segregation in all of its 23 wards. At least 80 per cent of households now have their own biogas plants along with decentralised compost system. Allapuzha also won the recognition of the United Nations Environment Programme (UNEP) as among the five cities in the world working towards tackling pollution through sustainable waste management process. India has enough examples of sound waste management practices, but the ‘one size fits all’ approach may not work in all Indian cities. A circular economy is the need of the hour, with focus on resource efficiency and recovery. This article is the first of a five-part series documenting the individual waste management case studies of India, Thailand, Laos, Cambodia, and Nepal.